While the Mainland Chinese entertainment circle has recently been plagued with Fan Bingbing‘s (范冰冰) tax scandal, a lot of actresses are also rushing to get married – some discreetly. 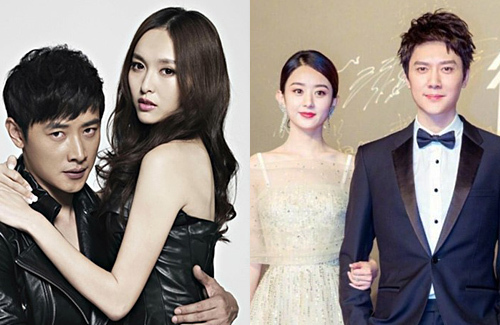 Recently, news broke out that Zanilia Zhao (趙麗穎) and her rumored boyfriend, William Feng Shaofeng (馮紹峰), as well as couple Tiffany Tang (唐嫣) and Luo Jin (罗晋) allegedly obtained their marriage certificates already. Although the 30-year-old Zanilia never confirmed her relationship with William, whom she collaborated with on the set of The Monkey King 3 <西游记·女儿国> last year, they are frequently spotted out in public together. Last year, the paparazzi released photos of Zanilia spending the night at William’s house, and the two staying at the same hotel. In mid-July, the 30-year-old Zanilia announced her hiatus from work, sparking pregnancy rumors. The actress’ manager also spilled that Zanilia has good news coming soon. William allegedly proposed to her after she became pregnant, and they quickly registered for marriage on September 1 at the Shanghai Civil Affairs Bureau. Afterward, they reportedly flew to Hong Kong to buy baby products. However, her agency has previously denied the pregnancy rumors. At the time, the actress also posted a picture of herself doing splits on social media to dispel the speculation. When Oriental Daily News asked the couple’s matchmaker, Wang HaiFeng (王海峰), the boss of Filmko, to confirm the marriage rumors, he said he doesn’t know. “If it’s true then I will wish them happiness forever,” he added. Similarly, Tiffany is reportedly pregnant before marriage as well. After she allegedly found out about the pregnancy in May, Luo Jin publicly announced their plans to get married. Their marriage ceremony will supposedly be held in Vienna on October 28, with only a few people from the entertainment circle attending it. @lynn90 lol, really depend. If the couple has stayed with one another long enough and a baby comes along, it’s just the right time. I wouldn’t call it shotgun really. Do not believe Liying is pregnant. Tiffany, maybe … since they have announced that she and LJ is going to get married.? Update: Zhao Liying posted an official picture of her marriage certificates and a portrait of Feng Shaofeng and herself. So they’re officially married! I don’t think it’s a shotgun marriage, very happy for them! @tungamy Woohoo! So happy for them!